FILE - U.S. forces take up positions on the outskirts of the Syrian town, Manbij, a flashpoint between Turkish troops and allied Syrian fighters and U.S.-backed Kurdish fighters, March 7, 2017. The key U.S. question about Turkey's offensive in northwestern Syria is whether Ankara pushes on from Afrin to Manbij, where U.S. forces and their allies against the Islamic State militant group are on the ground, U.S. officials said on Monday. 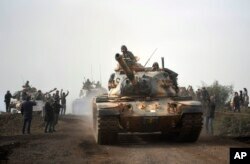 Turkey shelled targets in northwest Syria on the third day of a campaign by its forces and Syrian rebel allies against Kurdish YPG fighters, which Ankara sees as allies of Kurdish insurgents who have fought the Turkish state for decades. While the United States does not have forces in the area of Afrin, where the offensive is focused, it does in Manbij to the east, raising the possibility of conflict between forces allied with Turkey and the United States. Turkish army tanks enter Afrin, an enclave in northern Syria controlled by U.S.-allied Kurdish fighters, in Hassa, Hatay, Turkey, Jan. 22, 2018. Moreover, the United States hopes to use the YPG's control of the area to give it the diplomatic muscle it needs to revive U.N.-led talks in Geneva on a deal that would end Syria's civil war and eventually lead to the ouster of President Bashar Assad. The United States and Turkey, while themselves allies in the North Atlantic Treaty Organization, have diverging interests in the Syrian civil war, with Washington focused on defeating Islamic State and Ankara keen to prevent Syria's Kurds from gaining autonomy and fueling Kurdish insurgents on its soil. Preventing Turkish President Tayyip Erdogan from carrying out a threat to drive Syrian Democratic Forces (SDF), a U.S.-backed umbrella group dominated by the YPG, out of Manbij is central for Washington, U.S. officials said. "Manbij was liberated by the coalition (fighting Islamic State) and (this) would be looked at differently if Turkey started to go in that direction," said one U.S. official, who spoke on condition of anonymity. "The Turks have talked about it but there is no indication that they are going to go further east where we are," he added. "At this stage in Afrin it's a very different fight and a very different situation than if they do come further east." Any Turkish operation in Manbij is likely to be met with serious U.S. concerns, with a number of U.S. troops in and around the city. The troops were deployed in March to deter Turkish and U.S.-backed rebels from attacking each other and have also carried out training and advising missions in Manbij. "That would be a cause for concern and we're monitoring it closely," said a second U.S. official on condition of anonymity. "The protection of our forces is a top priority." This official added there had not been an impact on U.S. operations from Turkey's Incirlik air base. While much of the fighting against Islamic State has moved to small pockets, the United States would still need the YPG to hold territory, ensuring that the Islamist militant group does not reemerge. Speaking as he arrived in Paris, U.S. Secretary of State Rex Tillerson said the United States was in talks with Turkey and hoped to find a way to create a "security zone" that would meet Turkey's "legitimate" security interests. Pentagon officials are currently in Ankara as part of a U.S. delegation to discuss security issues, including in Afrin, Major Adrian Rankine-Galloway, a Pentagon spokesman, told Reuters. He said that "the armed Kurdish groups in Afrin" are not part of the coalition against Islamic State, also known as ISIS. "Increased violence in Afrin distracts from efforts to ensure the lasting defeat of ISIS," Rankine-Galloway added. "It also has significant potential to increase civilian displacement, refugee flows, and casualties." Gonul Tol, director of the Middle East Institute think tank's Turkey program, said persuading Erdogan not to move against Manbij could prove extremely difficult. The Trump administration's Syria strategy - crushing the remnants of Islamic State and reviving the U.N.-led Geneva talks on ending the Syrian civil war - almost entirely depends on preserving the 30,000-strong YPG as a fighting force. "The entire U.S. strategy rests on the Kurds. Even if Turkey doesn't attack Manbij, the fall of Afrin will weaken the Kurds, and that will weaken the U.S. influence with the Kurds, Tol said. "The only leverage the U.S. has (in Syria) is through the Kurds. "If Manbij falls, Raqqa is going to be threatened and that is key for the U.S.," Tol continued, referring to the Syrian city that Islamic State declared as its capital and from which it was driven out last year. "The U.S. will do everything to ease the tensions with Turkey. But I don't know what they will come up (with). They have to be very creative."